The ILO is organising a Knowledge Sharing Forum in Dar es Salaam, Tanzania from 28-30 May 2013 to share good practices, practical initiatives and new policies to promote decent work for domestic workers in Africa. In 2010, an estimated 5.24 million domestic workers were in Africa, accounting for 1.4 per cent of the total employed workforce and 4.9 per cent of paid employment. Around 70 per cent of domestic workers across Africa are women. Some 40 delegates from Tripartite delegations of Angola, Cameroon, Ethiopia, Mauritius, Morocco, Nigeria, Senegal, United Republic of Tanzania, South Africa and Zambia are attending the Strategic Forum. Observers will include representatives of the International Domestic Workers Network, ITUC-Afro, OATUU and IOE. The forum will focus on approaches to formalize employment relationships and tackling exploitative practices in domestic work in Africa. 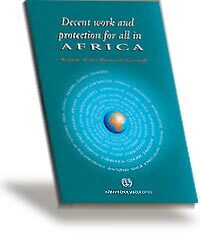 There are a number of issues underlying domestic work in Africa including labour exploitation and social structures, migration of domestic workers, trafficking of children and women into domestic work, gender dimension of domestic work as well as high informal employment and weak legal protection. Map and assess experiences and practices. The ILO’s tripartite constituents adopted the Domestic Workers Convention No. 189 during the 100th Session of the International Labour Conference in June 2011 to improve working conditions for domestic workers worldwide. The ILO’s Governing Body adopted in November 2011 a Strategy for action towards making decent work a reality for domestic workers. Knowledge-sharing is a key component of the ILO strategy to develop the expertise of its tripartite constituents.